Mr. Priveen Raj lives in Singapore where for the past 6 years he has worked as a business strategy specialist in various companies such as Airasia and Atos Global. He also a committed member of the Singapore Sai Movement, being the bhajan convenerof the region, and is also actively involved in many Sai Youth service initiatives. A swanky car, palatial bungalow, costly presents, and the best food. This was ‘Life’ for the first 14 years of my life. My father was a high flyer with an American offshore company. He simply adored my brother and me, and was always buying my mother the most expensive jewellery. In a pure, innocent way, I was proud of my family. I knew we were the envy of many. My parents were gods to me, especially my father. He was my ideal, my star, my hero. I stood the way he stood. I combed my hair the way he would. I even bit the insides of my mouth the way he did. Then, one day, everything changed forever. It was around 8:00 a.m. in the morning. I was skittering down the stairs to go for my football training, when I heard sobs amidst the chirping of the birds outside my house. I hastened downstairs, and was aghast to find my relatives pacifying my mother. My mother was hysterical, and my aunt and my brother (senior to me by nine years) were trying to console her. The earth collapsed beneath my feet, when I learnt the reason behind her heart-rending wails. My father had been unfaithful to my mother! I fell into bad company, and, in no time, took to smoking and drinking with a clique of “friends”, many of whom were members of triad gangs. A top-scorer earlier, my grades now toppled to ‘C’s and ‘D’s. Even that didn’t make any difference to me. Nothing was more important to me then, than “my crew”. We did the most unimaginable things. In every sense of the word, I had hit the rock bottom. But I persisted with my ways. After all, the alcohol gave me the high, and my ‘friends’, the strength to face the atrocities at home. In less than a second, the god I had looked up to and emulated had turned into a villain. My whole world crumbled. My father had befouled our family’s dignity, and shattered our happiness. I had never felt such seething anger and hatred. Over time, things at home became intolerable. I cannot really put in words the trauma that my mother and I underwent. My brother had just joined an airline company and was traveling a lot. But where could I go? Lacking love and attention at home, I sought attention elsewhere. I fell into bad company, and, in no time, took to smoking and drinking with a clique of “friends”, many of whom were members of triad gangs. A top-scorer earlier, my grades now toppled to ‘C’s and ‘D’s. Even that didn’t make any difference to me. Nothing was more important to me then, than “my crew”. We did the most unimaginable things. In every sense of the word, I had hit the rock bottom. But I persisted with my ways. After all, the alcohol gave me the high, and my ‘friends’, the strength to face the atrocities at home. The courts back then took a long time to finalize divorce cases. The proceedings would drag on for years. By the time my parents’ divorce was sorted out, four years had gone by and I was about 18. From a lavish lifestyle and a palace-like home, my mother, brother and I moved into a tiny two-bedroom apartment. The court gave my dad most of the assets! My mother had set up a small altar in the living area of our tiny apartment as there was hardly enough space to set up a proper mandir. This mandir was visible from the dining table in the kitchen. One Thursday afternoon, as I was having my food, I glanced at the mandir (mind you I had not stepped into a place of worship from that fateful day), and noticed, next to the picture of Ganesha, a picture of a holy man with a huge Afro hairdo! Immediately, I asked my mother who that was and she said – “He is God and His Name is Sai Baba!” She then related the story of how she had received Baba’s picture from a well-wisher just at the time when her marriage had hit the rocks! But I was skeptical. It was the easiest thing to fall into these ‘faith traps’, especially when we were going through vulnerable times. I warned my mother about these ‘Guru dudes’ who were out to make quick bucks, and admonished her for her blind faith. I then finished my lunch and went on to take my usual afternoon nap. As soon as I fell asleep, I had a strange dream. At the foot of my bed was the holy man with the “weird hairdo”, I had just spoken to my mother about! I remember looking at Him, and asking if He was Jimi Hendrix (a famous guitarist of the Woodstock Era of the late 60s), as I was a guitarist myself. He smiled and shook his head in disagreement. 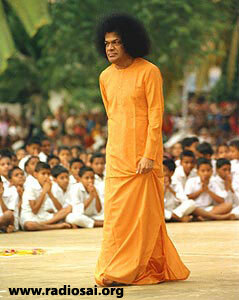 I then took a huge breath and asked “You’re Sai Baba, aren’t You?” He broke into a gorgeous smile and said – “Yes”. Baba then went on to bless me with rose petals. I woke up from my sleep, thoroughly confounded. I thought to myself that this would be the perfect dream if I had been a devotee, but I wasn’t. Had Sai Baba heard what I had said about Him? I hadn’t really had pleasant words for Him. So I panicked. I thought I was now marked for persecution by this Sai Baba person! I ran to the kitchen and told my mother about the dream. To my utter disappointment, she had tears of joy! I was really angry now, and more than a little scared. I told her that I’m going to go to Sai Baba’s study circle and make a donation so that He wouldn’t “harass” me anymore! I remember looking at Him, and asking if He was Jimi Hendrix (a famous guitarist of the Woodstock Era of the late 60s), as I was a guitarist myself. He smiled and shook his head in disagreement. 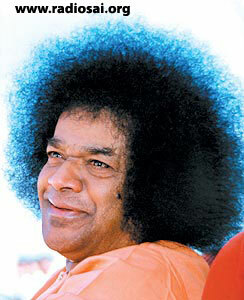 I then took a huge breath and asked “You’re Sai Baba, aren’t You?” He broke into a gorgeous smile and said – “Yes”. Baba then went on to bless me with rose petals. I went to the temple that night where the bhajans were held. I was shocked to see a devotee-crowd in the hundreds, especially when they were praying to this “Indian guy with the Afro hairdo”! I didn’t mind the session as I was into music, and the bhajans attracted me, albeit from a purely musical standpoint. After the bhajans, I donated $10 and bought a picture of Sai Baba in a white robe in the hope that He wouldn’t “bother” me anymore! As the days went by, I started attending the weekly bhajan sessions, though it was for the enjoyment factor alone and not at all for Swami. Of course, my lifestyle hadn’t changed even then. I was still smoking, drinking and freaking out with my gang. One day after school, I came home and fell asleep. And, then came the life changing moment. It came in the form of a dream, that afternoon, although, throughout the dream, I had this uncanny feeling of being awake and aware. I dreamt that someone was calling me and as I entered a room, I saw Swami sitting there, as majestic as only He can be. I ran to Swami and fell at His feet. But Swami drew them away from me. We then started talking about karma and the things that happened in my life – about my family, about all my bad habits, the world in general, and Him being God. Swami then allowed me to ceremoniously wash His feet with the pristine waters of the nine holy rivers. The dream marked the end of my vices. I started off by giving up meat and became a vegetarian. I gave up drugs, even my ‘friends’. My life revolved only around Swami thereafter. Six months after the dream, I sang my first bhajan. 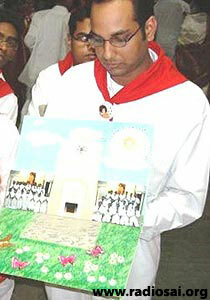 And I had a manifestation of vibhuti on a picture of Mother Mary on the eve of my 20th Birthday! 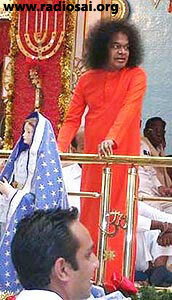 Swami even spoke to me three times during my trips to Puttaparthi thereafter. In 2007, about 250 youths conducted a spiritual campaign themed ‘Journey of Joy’ that concluded with a trip to see Swami in the month of December. Although we didn’t get to perform in front of Swami, the campaign was well taken up by the youth. On the last day, before a majority of us left for Singapore, Swami came for darshan in His car. As He approached our group, the window of His car rolled down. Even as we waited with bated breath, Swami beckoned to me. I presented Him the card that we had prepared, and told Him, “Swami, this card was made for You by all our youth from Singapore with all our love!” Swami smiled in response. Then He held my right hand and said, “Santosham, Santosham” (very happy, very happy), before driving away. Needless to say, we were all ecstatic. It was only later I realized that Swami had chosen to speak to me that day for a reason – another experience of Swami’s boundless love. Two days after I came back from the ‘Journey of Joy’ trip, I went out for dinner with my fiancé. While I was at my dinner, I suddenly experienced an excruciating pain and found myself unable to move. I was rushed to the hospital, where I started getting seizures every other minute. The doctors diagnosed my condition as acute viral infection. I was fed with morphine to mask the pain, and eventually I started losing my memory. Being in extreme physical pain, and suffering memory loss isn’t a nice place to be. On December 31, the situation worsened when my blood pressure dropped and vital signs became weak. The doctors were extremely worried. They had even informed my family. Over the next few days, much to the surprise of the doctors and the entire hospital staff, I started to recover. The whole recovery took about four to five months as my spine had been completely affected, and even basic tasks like walking and sitting proved laborious. By the time I recovered, it was already April 2008. And a new “Sai Project” was awaiting me. My friend Tien wanted to set up a restaurant. But, when he disclosed to me the location he had in mind, I almost fell off my chair. Tien wanted to set up his restaurant right in the heart of a notorious red light district in Singapore! I counselled my friend against executing his harebrained ideas until I heard him out. Tien had a noble intention in mind – to start something positive in a negative environment. So impressed was I with Tien’s unflinching idealism and resoluteness that I too came aboard the team. As my strengths lay in branding and marketing, I offered to look into the commercial aspect of the restaurant. The restaurant served organic Mediterranean vegetarian food. This was not our main source of revenue. We took it up more as a service project. As days went by, I felt that the best way to spread the love of Swami would be to actually employ the illegal workers in the locality, and deter them from illicit sources of income. So we started talking to these workers, and offering them jobs. Though we could nowhere meet their existing monetary revenue, we could, at least, give them their rightful identity as human beings with reason and purpose, and not merely merchandise to be bartered and sold. Our mission wasn’t easy. We were threatened with dire consequences, even death, by the procurers who used our employees for their illegal activities. But all through our endeavor, Swami made His presence felt, to assure us that He was with us always, and that it was ‘His Project’. What is more is that, spending time with these workers, and learning about their lives made me hold on to Swami even more, for which I can only be grateful to Him. Looking back, I can say it with unshakable conviction that God puts a person in the deepest waters, not to drown him but to cleanse him. And when He does put one through fire, it is because He knows best. If life was a bed of roses, would I cherish You, My Lord? If You gave everything I wanted, would I still need You, My Lord? The thorns of life that have pricked, You remove so lovingly. My guru, my guide, my mother Sai. As I walk this lonely rocky path, I forget that You are there. Teach me O Father, Teach Me My Lord, that You’re in Me and that I’m in You. Hold Me Close O Mother. Dear Reader, did this article inspire you in any way? Would you like more such Divine Love stories from Sai devotees? Please write to us at [email protected] mentioning your name and country. Thank you for your time.